Wherever you go in Greece, a lovely warm slice of freshly made spinach and feta pie is never far away. 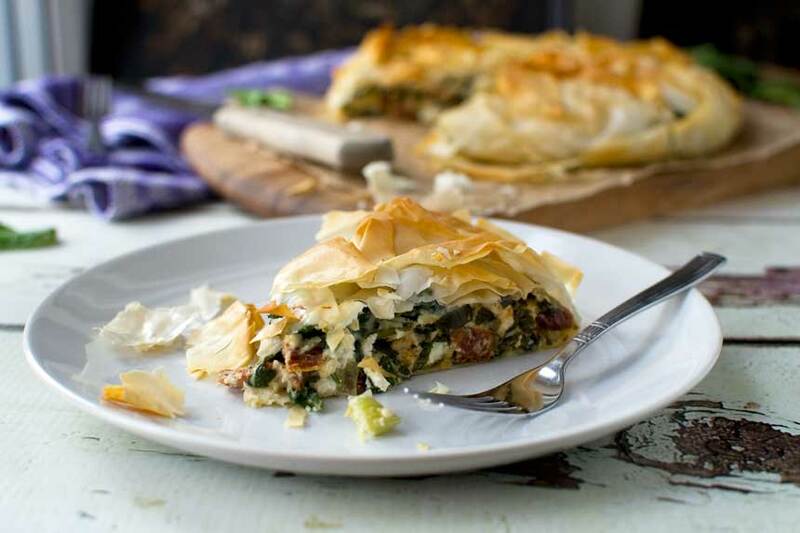 I miss it a lot, but luckily this spinach and feta filo pie is really easy to make at home with just a roll of readymade filo pastry and a few more ingredients. It’s quite embarrassing how many spinach and feta recipes there are on this blog (see my other Greek recipes here! ); but I’m not going to apologise for adding one more! Go to any Greek bakery, or Greek party, and you’d be shocked if there wasn’t some kind of spinach and feta cheese pie on offer. In fact, there really aren’t many occasions when a big fresh piece of spinach and feta pie (called spanakopita in Greece) doesn’t do the job. It’s wonderful for breakfast, brunch, lunch, dinner, or even an after clubbing snack (I’m too old for all that now, but the Greeks do love their all-nighters followed by some typical Greek comfort food!). Spinach and feta – a match made in heaven! There are many variations on the theme, but to me the taste is always pretty much the same. The marriage of spinach and feta cheese is one made in heaven. Well, in Greece at least, which many would say is the next best thing to heaven! Spinach and feta pie of any kind tastes amazing, and you’d think it was difficult to make, but really it couldn’t be easier. You must be bored of me constantly saying that everything is super easy, but for me this is an ultimate selling point! This is especially easy if you make it this way – with ready-made filo pastry. 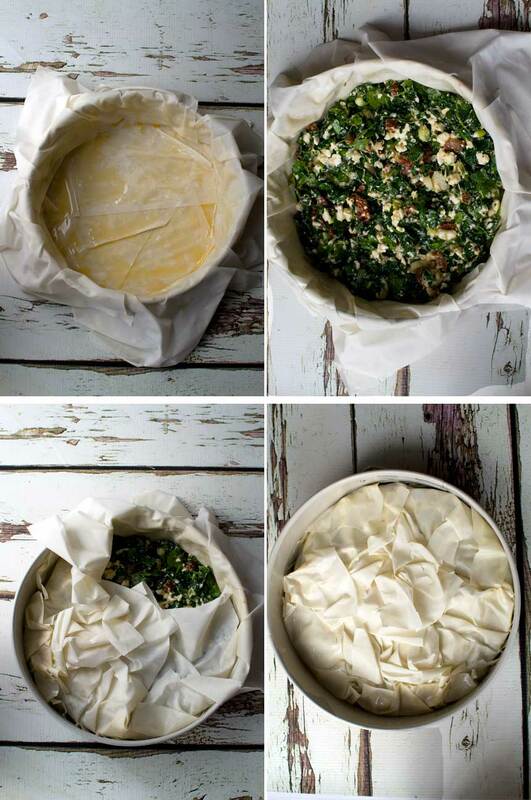 You don’t have to make or roll it, pre-bake it, or even fit it neatly into a pie dish. Just roughly layer 4 or 5 of the thin filo sheets into a loose-bottomed round baking tin, each overlapping onto the next and with the sides hanging over the edge. I’m not sure if this is a very good description, but don’t worry, it’s not rocket science, or even an exact science. Just roughly layer the filo sheets, brushing oil over the pastry between each layer. Then pile in the filling and fold and scrunch the over-hanging pastry over the top. 1 Drape sheets of filo pastry over a loose-bottomed baking pan, overlapping them over the sides. 2 Tip in the filling. 3 Scrunch the pastry that you left overhanging over the top. 4 Brush the top with a final layer of olive oil and bake! Bake for around 30 minutes, then slice and eat! This makes an absolutely delicious lunch for guests (or just for yourselves!). Serve it with a simple salad and maybe a blob of tzatziki. Bind together with a couple of eggs and you’re done – the filling is ready. 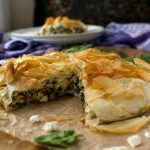 In my opinion, this spinach and feta filo pie is one of the tastiest snacks or light lunches you could ever eat. Next time I’m going to make a ‘spare’ one and freeze it for another time. Delicious, and it goes so well with the recipe I have planned for next week (stay tuned!). 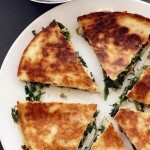 These Greek quesadillas with tzatziki are one of my older posts, but still a firm family favourite! Having a party? 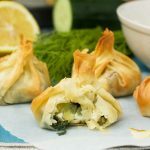 Don’t miss these Greek filo parcels. They’re always so popular! What baking pan do I use for this recipe? 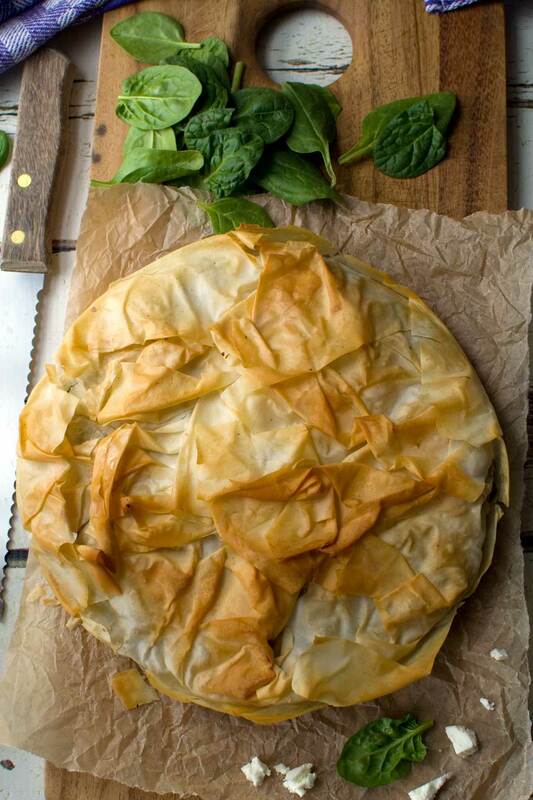 I always use an 8″ loose-bottomed baking pan like this one for this Greek spinach and feta filo pie. Ever tried Greek 'spanakopita'? It's soooo delicious, and perfect for any meal or snack. Try this quick and easy version, with just a few ingredients and a super simple filo crust. Pre-heat the oven to 355F / 180C. Now prepare the pastry. Lightly brush or spray an 8" loose-bottomed baking pan with olive oil, then drape a sheet of filo pastry in the centre of it at an angle, with about half of it hanging over the edge. Repeat with the other 4 sheets of pastry, rotating the pan as you go so that the whole of the bottom of the pan and the sides are covered with pastry. Brush lightly with olive oil between each layer. Please bear in mind that I've not included the brushed-on olive oil in the nutrition facts below! It doesn't matter if you don't have an 8" baking pan. Use any round baking pan you have - as long as it isn't too much bigger or smaller - and you'll be fine! Hello Bam! Yes! It’s crunches! Hope you do give it a go for Sunday Brunch some time! I will add feta to anything, mainly to salads at the moment…maybe time to add it to some pie! Hi Mariana! How are you? Please dooooo try the pie some time! Sign me up for anything with crispy filo. One day I will make it to Greece and sampling all of their delicious offerings, but for now I can enjoy this lovely pie at home. You MUST visit Greece some day Janette. The food is superb! This looks absolutely beautiful and so authentic! Need to try your recipe! Love spinach and feta! 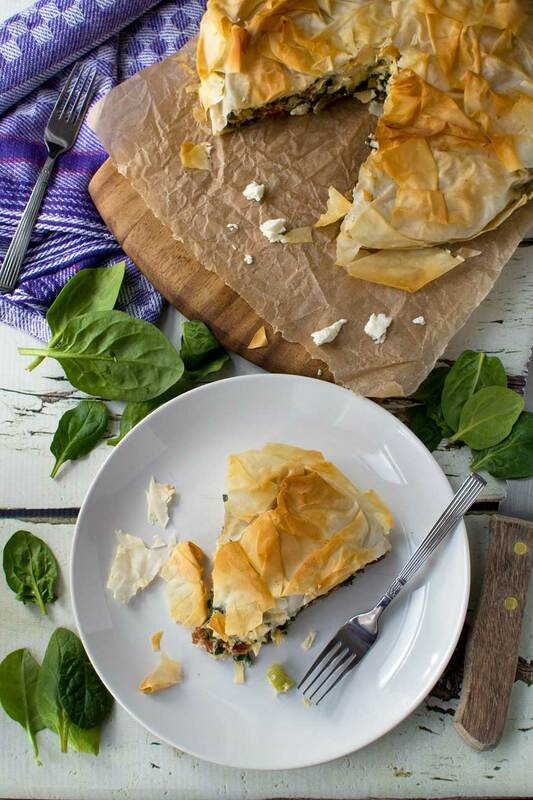 There could never be too many recipes with spinach and feta…keep ’em coming! 🙂 We order something really close to this at a local restaurant, but I’ve never made it myself. That’s going to change pronto! Hi Marissa! 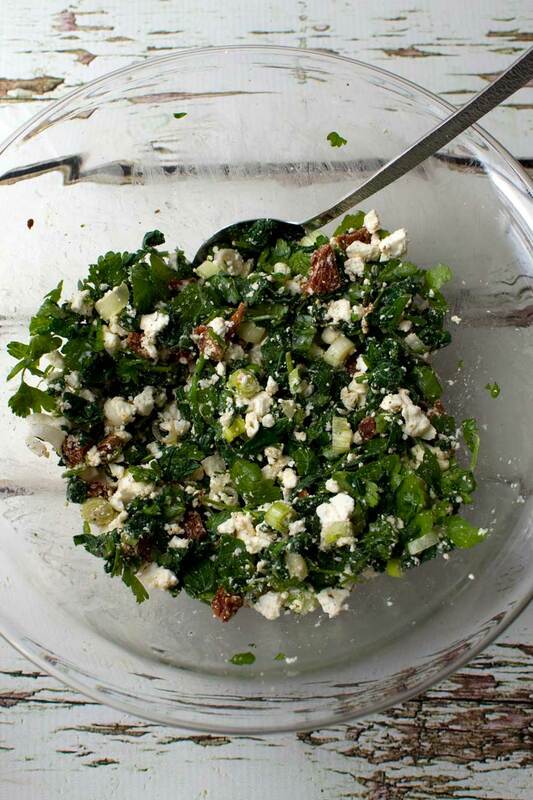 There’s always another spinach and feta recipe to post… lol! I really hope you do give this a go – I think you’ll love it! Tu réussies à merveille les recettes grecs.J’adore les épinards et la feta, je ne me laisse pas et avec la pâte filo ça doit être vraiment très bon! Merci, Eva. Je suis d’accord – c’est beaucoup mieux sans les lunettes de soleil!! Hi Linda, this is always best eaten fresh as the pastry is at its crispiest then. I don’t see why you couldn’t reheat it though to crisp the pastry up again. I’m afraid I haven’t tried it but I’m pretty sure it would work well. I’d say about 20 mins at 180C (cover with foil then remove for the last 10 minutes so it crisps up but doesn’t burn). I have never tried anything like this until now but it is amazing! Excellent recipe! Thank you so much for leaving your feedback, Nellie. So glad you enjoyed it! Crispy delicate filo dough is amazing in a pie like this. Totally agree that spinach and feta combo was made in heaven ! Hi Brandi – so glad you like this recipe. It’s one of my absolutely favourites and I hope it becomes one of yours too! Yum! 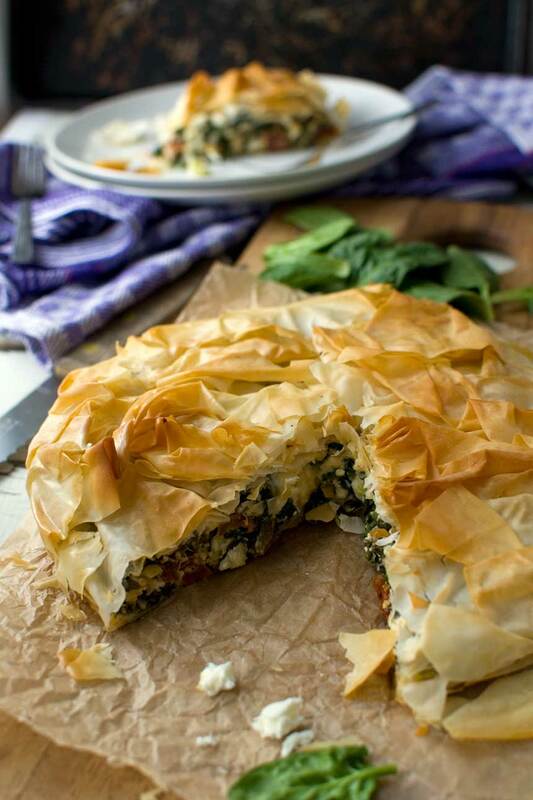 Spinach and Feta pie is one of my favorite dishes to order at a Greek restaurant. I am so excited to try making it at home! Thank you, Meredith! I really hope you do make it. I think you’ll love it!